The Spoon Dock by Belwares is patent-pending kitchenware designed to keep your most important tools closer to you. 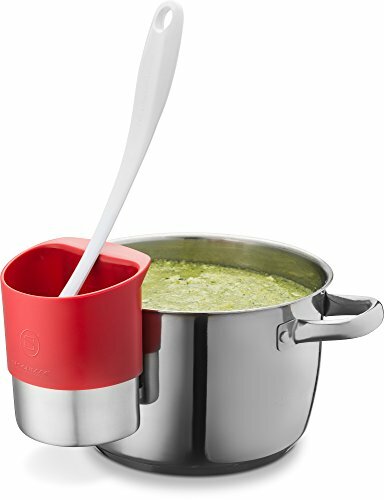 It is a compact cup with multifunctional characteristics which hooks securely to the edge of most cookware such as pots, pans, saucepans, stockpots, and even on BBQ grillers to keep stirring spoons, spatula, brushes, or serving spoons accessible for you. While it may keep your serving or cooking utensil well-put, this spoon dock collaborates on maintaining your countertop or table mess-free. It's both stylish and practical to use, and it adds accent to your cookware when you keep it hooked. The spoon dock makes a great gift, but once you try it for your cooking projects, it'll be hard to give away. Backed by 100% Satisfaction Guarantee. Click the add to cart button and order yours today! If you have any questions about this product by Belwares, contact us by completing and submitting the form below. If you are looking for a specif part number, please include it with your message.